This chapter describes the evolution of a multifaceted international partnership that includes international visitors to local schools and university classes, faculty and student exchanges, a study abroad program, and collaborative faculty research. The study reports how a continuum of international activities were developed between the host university and a university in The Netherlands. Despite the documented need for international experiences, few education majors take advantage of study abroad programs. These projects have expanded a traditional study abroad program to the wider university and local communities. Many local schools and educators can participate. The rewards and challenges in the development of multiple international activities are detailed. In the United States and elsewhere, teacher education programs must respond to state and national initiatives which promote the adoption of standards for the transformation of teacher education (Darling-Hammond, 2010; Zeichner 2010). Greater competence in cultural diversity is among the key elements identified as important for future teachers. According to Gay (2000), “explicit knowledge about cultural diversity is imperative to meeting the educational needs of ethnically diverse students” (p.107). Siwatu (2011) advocates for “incorporate[ing] self-efficacy-building activities in the preparation of culturally responsive teachers” (p.368). 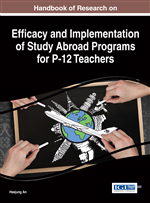 To address these important issues, it is recommended that, “teacher education programs infuse multiculturalism throughout the curriculum, offer stand-alone classes, require specific field experiences with diverse students, or incorporate study abroad programs” (Medina, Hathaway & Pilonieta, 2015, (p 74). Today, students from minority groups compose the majority of students in many schools (Sleeter, Neal, & Kumashiro, 2014). This diversity of cultures is especially true in New Jersey where the host university is located. The pupils in both urban and suburban school districts near the university are from a plethora of different cultures and countries. According to the National Center for Education Statistics (2013), 82% of the teacher population is Non-Hispanic-White. The majority of education majors are from white middle class backgrounds and do not match the cultural and ethnic diversity of students. Delpit (2006) documented problems when the ethnicity and background of teachers differed from that of families. Sanders (2006) suggests that many educators have an inadequate understanding of how to work with families in communities that differ from where they live. Given these factors, pre-service teachers need multi-cultural experiences to prepare them to meet the unique needs of students from multi-cultural backgrounds (Cochran-Smith, 2004). Study abroad programs are an effective way for education majors to encounter another culture (Medina, Hathaway & Pilonieta, 2015). However, very few college students participate in study abroad programs, and education majors are the least likely to participate in international activities (Open DoorsInstitute of International Education, 2015). Often, institutional policies and practices make study abroad difficult for college students. There are many personal and financial issues coupled with the lack of financial aid for short term international programs. Education majors often have difficulties with credit transfer due to the number of mandated courses and clinical experiences in teacher preparation programs (Cressey & Stubbs, 2010). First generation students, especially minority students, face numerous barriers to study and travel abroad. Even inexpensive, brief, study abroad programs may not be feasible for many students. This means that most study abroad trips include a limited number of students and one or two faculty members. Students without the means to travel abroad, or those with family obligations, do not participate. Faculty who are not involved in the program are also not engaged.